When making soap, you use a natural soap base, and then add many other ingredients on top of that. The base is the soap portion that contains lye and a few other ingredients. This material can be caustic, which makes it dangerous if not treated carefully. This is why it is best to purchase the base separately. With a separate base, you do not have to worry about mixing the lye and other ingredients correctly. There are other things you should consider adding to your soaps. Oils. When making soaps, you have to add oils to the lye. There are many different types to add, depending if you want to add scents or other characteristics to the soap. Mostly, the oils add hardness to the bars. Some oils add the ability to lather, clean, and condition. Beeswax. Beeswax is a thickening agent. It makes the soap hard, as in more solid. Less is more, with this ingredient, as it will stop lathering at a certain concentration. In addition, it adds a nice scent to soaps. Shea butter. This is a fattening oil, which means you only need a little. Use it to add moisture to the skin. However, do not use it as a sole lathering agent. This oil does not lather well. Essential oils. These oils add fragrance to the soaps, but also add other benefits. Always research ingredients before making the soaps, so that the ingredients are known and the scents can be predicted. Oatmeal. 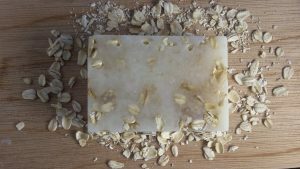 Oatmeal serves several purposes in soaps. It preserves the natural scents of other oils in the soaps. It can make a good exfoliate for the skin, but only when it is finely blended. Herbs. Adding herbs to the soaps makes them smell really good. It also helps when exfoliating. Many soap makers use the herbs and other materials to color the soaps. They use ground-up parts of the fruits and vegetables. Exfoliates. Almost any rough material can be used to wash up. The exfoliates stick out of the soap, and they keep the skin young and supple. Some popular exfoliates are ground-up almonds, seeds, oatmeal, and pumice stone. Fragrance. Adding a fragrance to the soaps make them smell good. However, many of the ingredients also double as fragrance. Depending on what you add to the ingredients, make sure you know what each item smells like to know what the final product will be like. Roots. Roots can add color to the soaps. In addition, the roots tend to add other benefits to the soap. It could make the skin smooth and other factors. Goat milk. Milks make the skin soft and smooth. They also add moisture to the skin. It is possible to mix a small amount of goat milks into the soap bars. Do not add too much, or else you would never get that curdled milk smell out of the skin. For more information on making soaps, contact us at Essentials by Catalina.